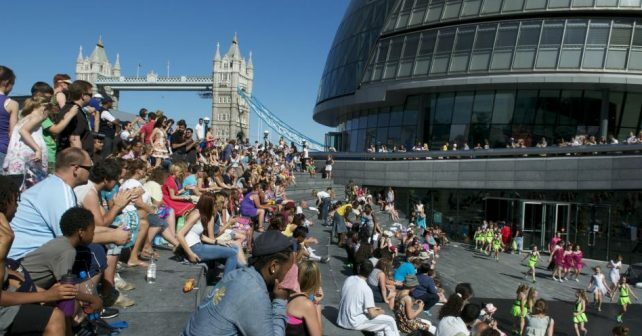 If it’s fun outdoor activities you’re looking for, make space for the London Bridge City Summer Festival. The Thames-side jamboree – set across three destinations along the river – will feature a mix of outdoor screenings, music concerts, dance classes, circus displays and family events. Best of all, most of it’s FREE. Highlights this year include live music from madcap band Chainska Brassika, a breakdancing competition, your chance to try your hand at reggae aerobics plus a nostalgic screening looking back at London Bridge of years gone by. Visitors can catch 90s classic Bill & Ted’s Excellent Adventure outdoors on the big screen! There’ll be some feel-good (and family friendly) outdoor cinema flicks on show too. Bill & Ted’s Excellent Adventure, Cool Runnings and Finding Nemo are all on and all gratis! Elsewhere on the big screens, catch a host of summer sporting events, including Wimbledon and the Tour de France. If you fancy a laugh head over for a comedy evening with Mark Dolan before our London-based stand-ups decamp to Edinburgh for the August festival. All activities take place a short hop from the River; at The Scoop, The Pier and Hay’s Galleria.